COMING SOON! 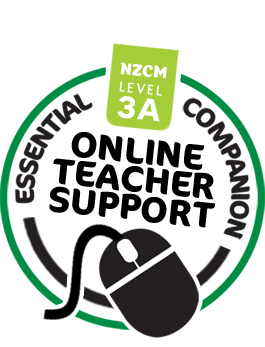 Level 3A Online Teacher Support. THE PERFECT TEACHER AID TO HELP TEACHERS WITH THEIR BUSY SCHEDULE. NEW FOR LEVEL 3! WE HAVE DONE THE WORK FOR YOU - 270 Links to Suitable Interactive Sites that are suitable for using with the Level 3 New Zealand Curriculum and which complement each section of our Student Resource book. No more searching the internet for suitable sites. 86 Teacher Resource Sheets, which are printable and include photos that relate topics to real life, games, practical starter activities that you can do with a class or group and incomplete worked examples for you to finish. Teacher Notes for every subheading of each chapter of the Level 3A book. 147 Printable Masters required for the use of the book, including 74 Generic Masters like isometric paper, squared paper, number tiles and playing cards. PLUS, 22 Number Knowledge Sheets. Also included within the Printable Masters are Rich Tasks that are in each book and could be used for a group or homework. 21 Getting Started pages for you to display to aid class/group discussion. 21 Interactive Check ups that students can do independently or in groups. Mapping to the New Zealand curriculum. A comprehensive list of what Students Should Already Know for each chapter, with references to earlier books in the series. Ideas for Self Evaluation and for setting up a Question of the Day. LEVEL 3A ONLINE TEACHER SUPPORT IS THE PERFECT TEACHER AID TO HELP TEACHERS WITH THEIR BUSY SCHEDULE. Students Should Already Know is now featured at the beginning of the Chapter Overview, and no longer in the Green navigation box. Students Should Already Know has also been simplified into a table format. Other Links (Links to Other Areas) is now featured at the end of the Chapter Overview, and no longer in the Green navigation box. Resources for Teachers (Teaching Ideas) are now accessible through the Green navigation box and no longer within the Chapter Overview. Also added to the Green navigation box is a BRAND NEW FEATURE - Links to Interactive Sites. 270 links suitable for using with the Level 3 New Zealand Curriculum and which complement each section of our Student Resource book. No more searching the internet for suitable sites. Number Knowledge resources are now added to the left hand side navigation before each relevant chapter to enhance usability.